Did you miss our latest KNCV update? Read the newsletter here and subscribe to be sure to receive the next one in your mailbox. Unique partnership with private practitioners against drug-resistant TB in India. 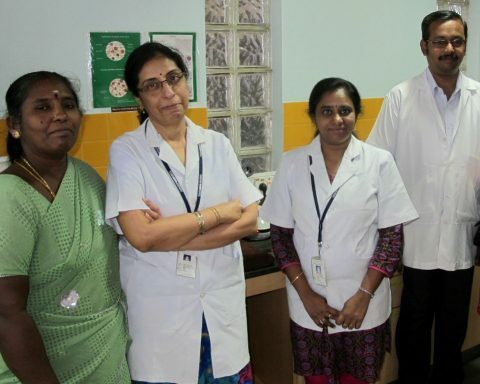 The fight for a TB-free India continues to gain ground with the launch of an innovative project in the city of Chennai. Through public-private partnership project EQUIP, patients visiting private health practitioners can now be offered rapid, accurate diagnosis for TB and multidrug-resistant TB. ‘Making a difference’: White Paper on Dutch research for global TB elimination. At the Annual Symposium ‘Innovation is everything’ KNCV presented a White Paper on Dutch Research for global TB elimination. KNCV Tuberculosis Foundation regularly supports PhD candidates. This week we welcome Abdallah Mkopi from Tanzania, and last month Sanne van Kampen successfully defended her PhD thesis. KNCV Update is a free publication of KNCV Tuberculosis Foundation and is distributed amongst persons who are interested in the fight against TB. Please visit our website www.kncvtbc.org for more information. For subscription inquiries please contact update@kncvtbc.org. Do you know any colleagues, partners, friends who might be interested in Update? Please send us an email with their email address and we will take care of it. In no event shall KNCV Tuberculosis Foundation be liable for damages relating to the use of this newsletter or its content (or the impossibility to use them). This includes damages caused by viruses; incorrect, inaccurate, or incomplete information; or information on the websites (or any other source of information) to which the newsletter refers. The limitations or exclusion of liability in this article is not applicable in so far as the damages are the result of a conscious or purposefully negligent shortcoming of KNCV Tuberculosis Foundation.